Fairy Party Ideas - I Do Believe in Fairies! 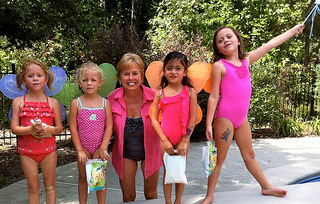 We used these fairy party ideas for our 5 year old granddaughter's pool birthday party theme. We all believed in fairies by the end of the day. 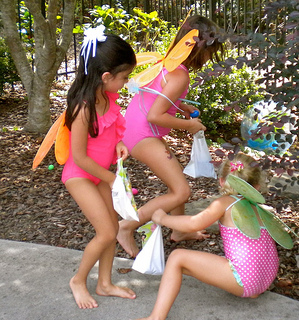 The most important fairy party supplies are, but of course, fairy wings! Get enough wings for each party guest and lots of extra ones for decorations. 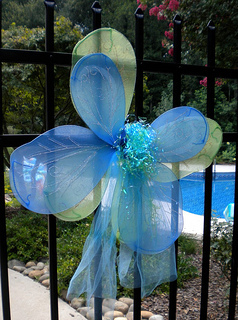 Fairy wings from the Dollar store adorn the pool gate, hang from tree branches and are used a table centerpieces. Repeat the same color scheme where ever you decorate. I always decorate the pool gate. 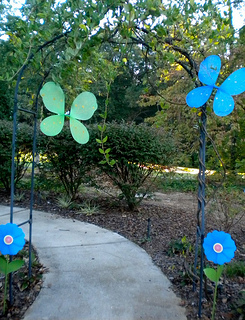 Using the same fairy wings, Easter grass and blue netting, tie the wings to the bars on the gate. 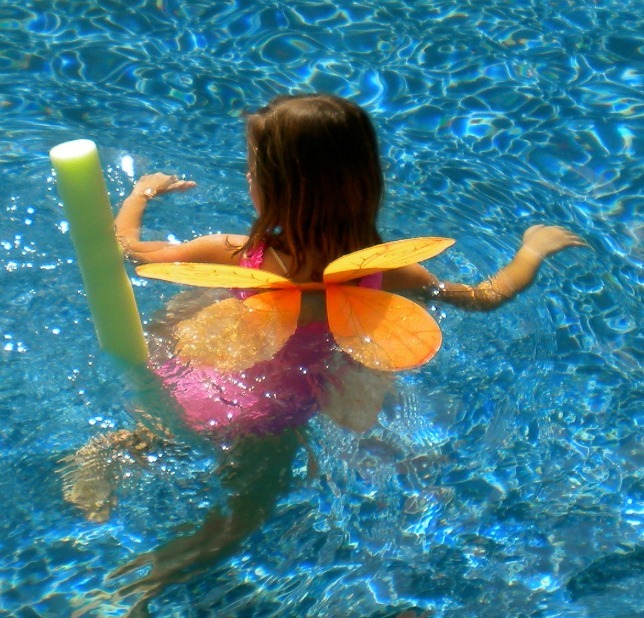 Using the straps of the wings tie the wings around the umbrella pole -or you can use a large cylindrical vase. I used blue on one side and green on the other. Sparkling Easter grass hides the straps in the middle and is used again on the blue netting that is draped around the bottom of the pole. We used lots of pixie dust for sprinkling on fairies who have earned their wings. Sprinkle fairy dust along the sidewalk leading to the pool or party area. Decide on a color scheme and repeat the colors in your decorations and paper party goods. Hang more fairy wings from tree branches, garden arbor or from your patio umbrella ribs. 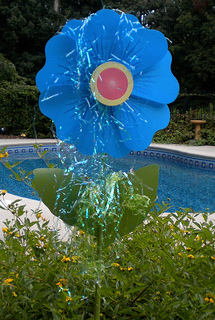 Plastic spinning flowers greet guests and are placed at the arbor, the pool gate and by the steps to the pool. I found a variety of colors at Hobby Lobby and bought some in yellow, pink and blue. Since we don't get much wind, we draped sparkling blue and green Easter grass on the spinning flowers and the wings. 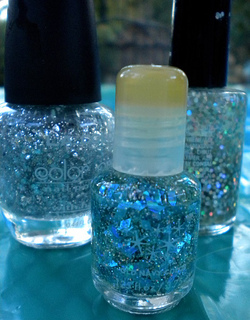 Sparkling finger nail polish for sparkly fingers and toes was a big hit for all of the girls. Add a make-up or hair station too. 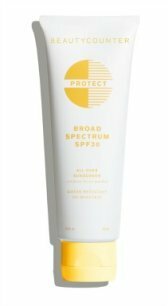 There are lots of hair gels and hair spray that can provide even more sparkle. Blue wands for each fairy are a must. The girls used them for the Fairy Parade and as take home favors as well. 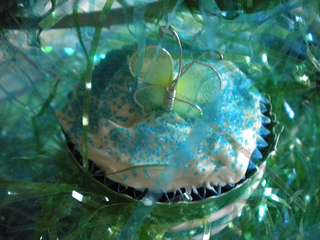 Green cupcake wrappers, blue colored sugar and small gossamer wings make the perfect fairy party cake. Place more blue and green sparkling grass around the cupcake tower. 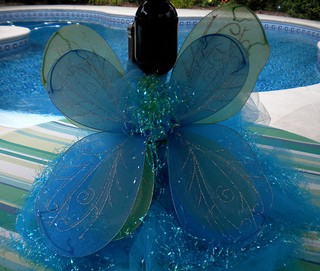 Simple bright blue bags have small fairy wings sitting by the handle. 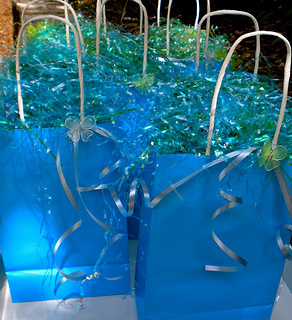 Some blue ribbon and more sparkling blue and green Easter grass make colorful and fun party bags. Fairy dolls from the dollar store made great party favors. Hair bows, sparkling nail polish and fairy wands make great favors as well. The fairy wings went home with guests for more fairy fun after the party. Be sure to have lots of pixie dust. To earn their fairy wings, each guest said, "I believe in Fairies" and then were sprinkled with pixie dust to help them "fly." Fairy dust is a must! 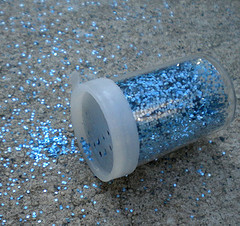 Sprinkle it on the sidewalk leading to the party area and on the girls when they earn their fairy wings. Want some ideas for fairy party games? Fairy wings, pixie dust and sparkling wands turn every little girl into fairies as they dance and parade to Fly To Your Heart by Selena Gomez. 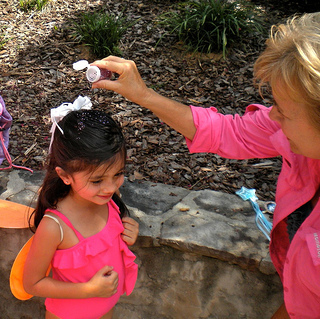 A scavenger hunt around the swimming pool provided lots of fun and surprises. 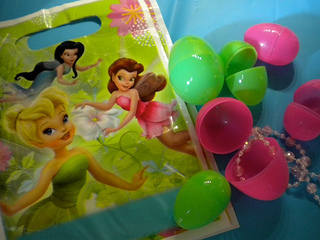 Tinker Bell gift bags are used to gather colored eggs that are hidden around the pool. Assign one color to each guest - i.e Emma gathers all the pink eggs and Sarah all of the purple eggs. Tinkerbell party bags were given to each fairy with their name and a color written on the bag. Each guest looked for eggs with their assigned color. Easter eggs are stuffed with fairy stickers and fairy gold (pennies, nickles and dimes). Party guests earn their wings by saying, "I believe in fairies" three times. After putting on their wings sprinkle pixie dust on their heads. Selena Gomez gets everyone dancing with "Fly to My Heart." The birthday girl loved dancing to her fairy song in the Fairy Parade with her wand and wings. Always include music and a theme song to your party. Let your child pick out the song. 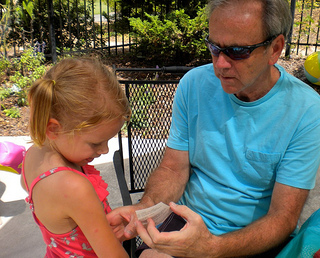 I just went to You Tube and typed in "fairy songs" one afternoon with our birthday granddaughter. After listening to several songs, she picked out, "Fly to My Heart" by Selena Gomez. The song, well, actually the whole album was downloaded to my ipod. 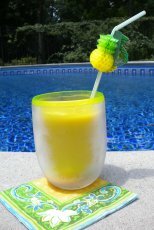 I love my portable iPod player for our outdoor pool parties. Now, every time our grandaughter is at the house, she asks us to play her favorite fairy song. Sparkling pink, silver, and purple nail polish go on fingers and toes at the Nail Polish Station. Set up a make-up station as well with lip stick, face powder and eye color. Fairy Temporary Tattoos were a big hit. All you need is an adult, tattoos, a bowl of water and a washcloth. Put on the tattoos and nail polish while waiting for all of the guests to arrive. Two at a time the guests "ride" the fairies by sitting on the foam noodle and race to the other side of the pool. A piggyback race takes on new fun by turning it into a Peter Pan Race. 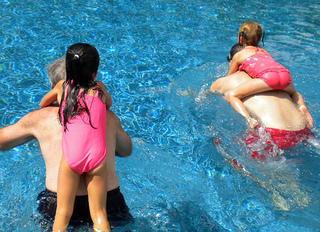 Dads are Peter Pan and the fairies ride piggy back. 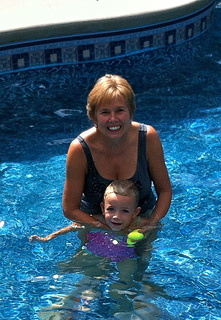 The team who reaches the other side of the pool first wins. Place pennies, dimes, or nickels in dive eggs. Throw the dive eggs so that they are at a depth comfortable for your guests. One at a time see how many eggs the player can gather in one breath. Each player gets to keep what's inside their eggs. Crossing "the lake" becomes dangerous when a hungry crocodile sits waiting for any fairy that comes near him. 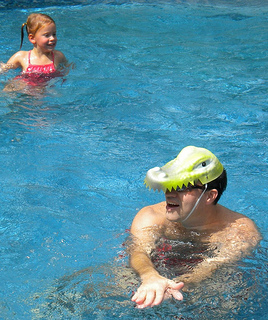 A foam crocodile mask from the dollar store is any easy prop. 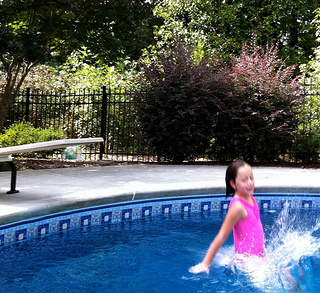 Have kids who can swim line up at the diving board and one at a time see who can make the biggest "Mermaid Splash." Remember the cotton ball on the spoon game? This is a fairy fun version of it. 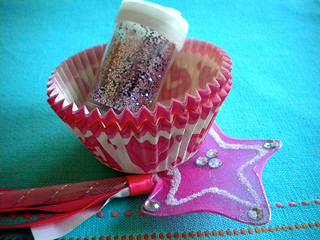 Place fairy dust in a pink cupcake liner - provide one for each player. 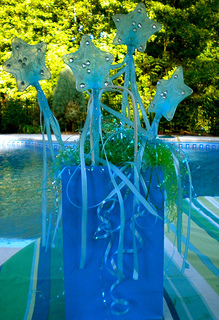 The player tries to carry the cupcake liner on the flat surface of the star wand to the other side of the yard or room. The goal is to get to the end without spilling any fairy dust. 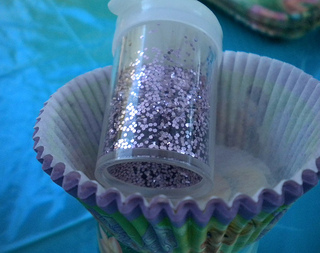 You could also use sprinkles used for cupcakes or cookies instead of sparkles. Play music while the kids are doing their fun fairy walk. Songs from the Disney album, Tinker Bell - Songs from the Heart are great. 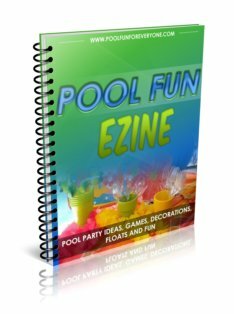 See how swimming pool games turn from ho-hum to something memorable when you put a theme to the party? We knew that the games were a big hit, when one little fairy came up to me and asked, "Could we please play some more fairy games?" Oh, but of course! 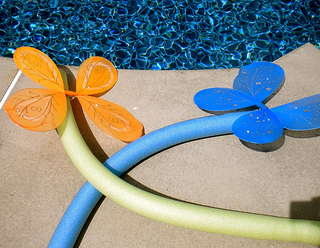 Giving a pool party a theme, turns any ordinary pool party into an extraordinary one. Make your party memorable with a fairy party theme.